On Monday, the U.S. Food and Drug Administration (FDA) announced good news for a subgroup of patients with ovarian cancer when it approved a molecularly targeted therapeutic called rucaparib (Rubraca) and a test to help identify patients eligible to receive it: Women with advanced ovarian cancer that harbors cancer-associated BRCA gene mutations. The ovarian cancer microenvironment. Image courtesy of the National Cancer Institute. Rucaparib is the second in a class of molecularly targeted therapeutics called poly ADP-ribose polymerase (PARP) inhibitors to be approved for treating advanced BRCA-mutant ovarian cancer. The first in the class, olaparib (Lynparza), was approved for this use in December 2014. The newly approved molecularly targeted therapeutic is intended for patients with advanced ovarian cancer who have already been treated with two or more types of chemotherapy and whose cancer harbors a deleterious BRCA mutation, as detected by a companion diagnostic test called the FoundationFocus CDxBRCA test, which was approved by the FDA at the same time as rucaparib. The deleterious BRCA mutation can be an inherited mutation or one that was acquired during the patient’s lifetime. According to the FDA announcement, the approvals of rucaparib and FoundationFocus CDxBRCA were based on initial results from two small clinical trials involving a total of 106 patients with advanced ovarian cancer that had worsened despite treatment with two or more types of chemotherapy. The data showed that 54 percent of the patients who received rucaparib had partial shrinkage or complete disappearance of their tumors for a median of 9.2 months. However, given that the approval centered on response data, rather than overall survival, rucaparib’s manufacturer, Clovis Oncology, is required by the FDA to conduct a study to confirm that the drug improves survival for patients. 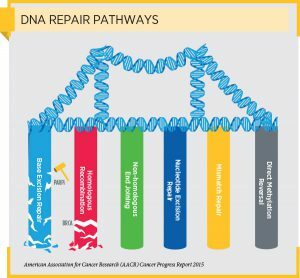 As discussed in a recent post on this blog, a key function of both PARP and BRCA proteins is repairing damaged DNA. Although they work in different DNA repair pathways, the pathways are interrelated and disruption to both pathways can ultimately trigger cell death. 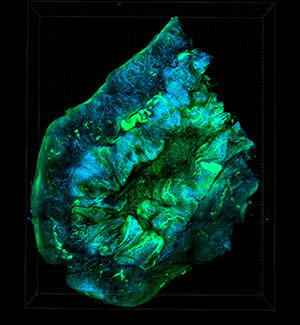 As a result, cancer cells harboring cancer-associated BRCA gene mutations that disable the ability of BRCA proteins to repair damaged DNA are particularly susceptible to PARP inhibitors, which work, at least in part, by blocking the DNA repair function of PARP proteins. Given the way in which PARP inhibitors such as rucaparib exert their anticancer effects, these therapeutics are being tested as potential treatments for other types of cancer that have defects in a DNA repair pathway. For example, initial results from a clinical trial testing the investigational PARP inhibitor veliparib as a treatment for locally recurrent or metastatic breast cancer with BRCA1 or BRCA2 mutations were reported recently at the San Antonio Breast Cancer Symposium. The data showed that adding veliparib to carboplatin and paclitaxel chemotherapy improved the overall response rate without increasing adverse events. However, additional clinical trials will be needed to provide definitive answers as to whether veliparib should become part of routine clinical care for breast cancer, according to the study author Heather S. Han, MD, associate member at the Moffitt Cancer Center in Tampa, Florida.